Heartbreaking to think this soldier might have had a child the same age at home. It really shows the humility and humanity of the people in the war. Just because they perceived each other as the “enemy” doesn’t mean either of them were more or less good than than the other. At the end of the day, everyone is still human. Photo taken in Volkhov area. “I want to help you. I want to help you… Stop that! Stop it! Stop it! I can bear the rest of it. I can’t listen to that! Why do you take so long dying? You’re going to die anyway. Oh, no. Oh, no. You won’t die. Oh, no. You won’t die. They’re only little wounds. You’ll get home. You’ll be all right. You’ll get home long before I will. You know I can’t run away. That’s why you accuse me. I tell you, I didn’t want to kill you. I tried to keep you alive. If you jumped in here again, I wouldn’t do it. You see, when you jumped in here, you were my enemy – and I was afraid of you. I've been seeing a whole lot of negative comments on some of these pictures, but I pass by really beautiful pictures, like this one, with nothing. This is obviously a very empathetic father, who can imagine his child in this ones place. It's very moving. I love it. I'd like to think that even a man who didn't have children would be kind to a child like this. It shouldn't take imagining your own child suffering to make you want to help someone else's suffering child. 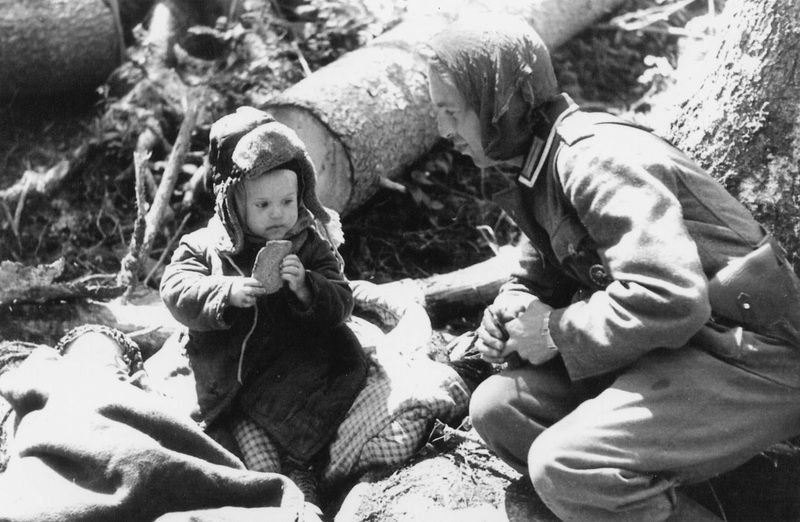 My Mum, born in Austria and six years old by the end of the war, told us of a Russian soldier who came out of the village butcher shop with a parcel of meat. When he saw my Mum, small and skinny, hopping around and playing in the street, he stopped, gave her the parcel, and said "Here, take this home to your mother". These acts of kindness made a deep impression- obviously if I who wasn't even born then am now relating the story- and are remembered with gratitude. they killed our children, they burned them alive in the villages, they took blood from children for their soldiers in concentration camps!!! And you are touched by this picture? Some of them did, but there have been a lot who didn't. My greatgrandfather was murdered by the nazis too. He wasn't jewish, he wasn't even a communist or a social democrat. He was against the war. That was enough to get killed during the dictatorship of Hitler. My grandfather smuggled jewish people out of Hamburg as long as this was possible. He was risking the lifes of his wife an his two sons and his own by doing that. So stop talking about 'they'.